One of the great mysteries of recent stogie history is why the Oliva Angel 100 wasn’t a raving sensation. Somehow, they seemed to go right from the roller’s table to the virtual closeout bin. No advertising? No distribution? Probably both. I hadn’t heard of them until they appeared on CigarBid.com at an average gavel price of $9.00 per five-pack. Between their pedigree and price, they were worth a shot. Information on these is tough to come by, though Tom at Keepers of the Flame did an excellent job researching its origin here. 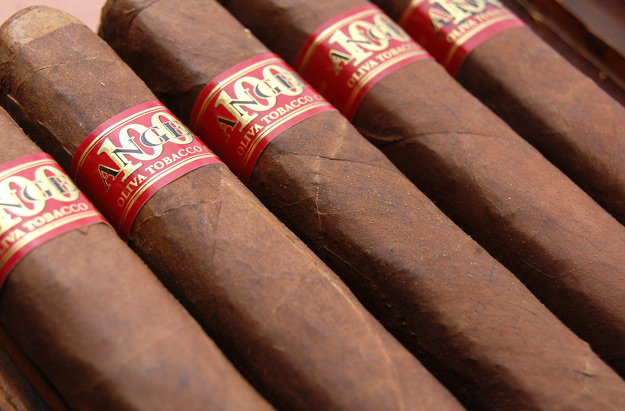 Angel 100 was produced to commemorate the birth of Tampa’s legendary tobacco man Angel Oliva. Angel founded Oliva Tobacco Company, not to be confused with Oliva Cigar Company, the unrelated maker of the Series O, S, G and V.
Oliva Tobacco Company (OTC) operates and oversees plantations across the globe and supplies leaf to countless manufacturers, including Rocky Patel, Fuente and Ashton. As leaf growers and brokers, however, they do not produce their own cigars. Thus, production for the Angel 100 line was farmed out to NATASA in Esteli. The La Joya is a 6″ x 54 box pressed toro, one of four sizes in the line. It is full bodied from the start, spicy-sweet and woody with an interesting cinnamon note. I notice not so much the flavor of cinnamon (though it is present), but it has the same bright, tingling mouthfeel one gets from a piece of Big Red. The character doesn’t change much as smoked, though it does intensify. The larger gauges like this La Joya and the 52-ring La Meca develop earthy, mushroomy flavors that I haven’t noted in the slimmer 1961 or O.T.C. sizes. I should add that I tried a cello/no cello aging experiment and found that they mellow considerably sans cello. The spice recedes, leaving you with a smoother, woodier smoke. When left in their original packaging they remain spicy. The only issue with the Angel 100 is that 25% are freakishly ugly. Colors are all over the lot. Some wrappers sport veins the size of chopsticks, almost as if they were rolled with the bottom side of the leaf facing outward. Others have handkerchiefs and caps that are a couple shades lighter than the rest of the cigar, indicating they were cut from a different leaf. But don’t let these aesthetic flaws put you off. The construction oddities don’t extend to the smoke’s performance. Each is well-packed, burns evenly and draws easily. CONCLUSION: Bottom feeders like myself who stumbled upon the Oliva Angel 100 lucked out. They’re powerful, loaded with flavor and take well to aging. I think of these as a poor man’s VSG. If you can overlook the fugly ones, there’s nothing not to love. They’re getting scarce, however. JR Cigars still has them in selected sizes at $12.95/5. Run, don’t walk. A lot of people were turned off by these because they were released WAY too early. They were really rough. With six months to a year on them they’re one of the best buys around. I just cracked a La Meca five pack that I bought last July and smoked one last night — smooth, aromatic, delicious. Floral accents you don’t get from NCs too often. Unfortunately, they’re still ugly. Age don’t fix that. BTW, your photos are incredible. Are you a pro by any chance? You got me sold. I found the 1961 (6×44) bundles of 20 for $20 at www.lynncigars.com/cigars. Don’t buy them all, I will not be able to pick them up until morning. Yes, I suspect you’re right, Tom. They were a bit in-your-face when I got mine as well, which is what led me to pull some out of the cello. But ugly is forever, indeed! As far as the photos go, I’m just a Photoshop-armed hobbyist. Thanks for the kind words! Ooh, nice get, Stinkie! 20 for 20 is even cheaper than I was getting them on C-Bid last year! The 1961 is a good one, too. The narrower ring gauge concentrates the flavors, IMO. Thanks for the heads-up! I’ll go easy. I love these, when I don’t have draw issues. I bought a bunch of them last year, and forgot about ‘em. I started smoking through them a month ago, and man, they’re great! Tasty and cheap, how can you beat that? I had someone give me a stick last summer and it was awful. Didn’t enjoy it one bit. My opinion at the time was, what a terrible cigar to celebrate a 100 year Anni. Maybe they have improved?? Ironmeden: Hmm. Just a personal preference thing, I guess? As Tom noted, they do mellow in time, though I confess to having liked them when they were young and brash. Even though it was a little over-the-top, all the elements were there. Placed my order, thanks again for the tip on these. Glad to hear it, Stinkie! Enjoy. I too stumbled upon these at CigarBid.com. I think I am on my fourth purchase of lot of 25. I stumbled upon your site trying to research them for more info. Thanks for doing all the work for me. What got my attention was that in my last shipment of OTC’s someone accidentally tossed in a La Meca. I didn’t even know they had that size and I am a BIG fan of Torpedos. Great job on the reviews and thanks for the tip on the sans cello! If you have trouble finding these Angels, try a few of Jr Cigars alternatives. Many are produced at NATSA and some have a similar profile. Sorry I can’t be of any more help, as to which ones to try.